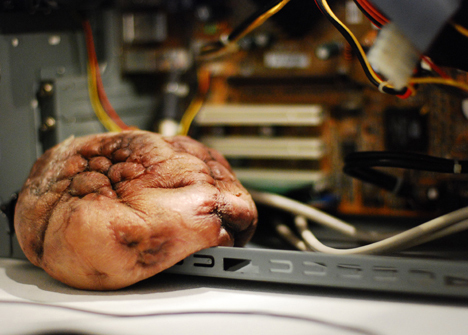 Interactive media artist Mio I-zawa's "mechanical tumor" is a quivering hunk of fleshy, organic-looking material that expands and contracts depending on the amount of stress your computer is experiencing. Equipped with a series of motors and pneumatic actuators, the mechanical tumor pulsates gently when the CPU load is low. When the CPU load is high, the tumor's air compressor is activated, causing the lump of flesh to inflate. The size of the tumor fluctuates according to the CPU utilization rate, giving the user a very tangible reading of the computer's stress level. ...and "elastic cell," a system of 46 soft pulsating cells that react to human touch in a complex, lifelike way. Where can I get one? This would be great for some extreme case modding. These are totally a waste of time. they're not even innovative gadgets. it's old technology in a new skin..
it's kinda like, "OK. Instead of having a computer read out on these pressure sensitive servos being pressed, lets manipulate the servo in the next ball of rubber to mimic." and the expanding tumor case thing.. big deal. i could get a digital LCD readout that would be way more accurate and informative. and those walking hearts.. wtf, are these guys in high school shop class or something? how is this worthy of news? Gadget, in case you didn't notice, it's not supposed to be innovative gadgets, it's art! This can not be unseen #1 | Yo Sekai!